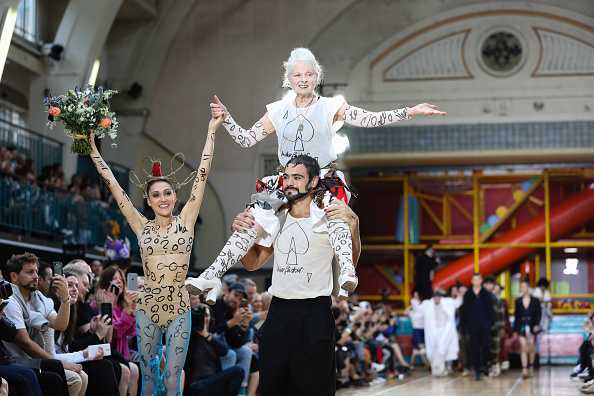 If there’s anyone we expect to break “rules” during fashion week, it’s Dame Vivienne Westwood. The legendary fashion designer turned activist uses her fashion shows as a platform to voice her concerns about climate change and the economy to anyone willing to listen; or at least anyone willing to watch her fantastical designs sashay down the runway. The creatrix of the punk aesthetic hasn’t lost her rebellious nature in the forty years she’s been designing. In fact, you could say she’s gone even less mainstream, and her spring/summer 2018 collection is a testament to that. But in true Viv fashion, it’s also a testament to art and performance. 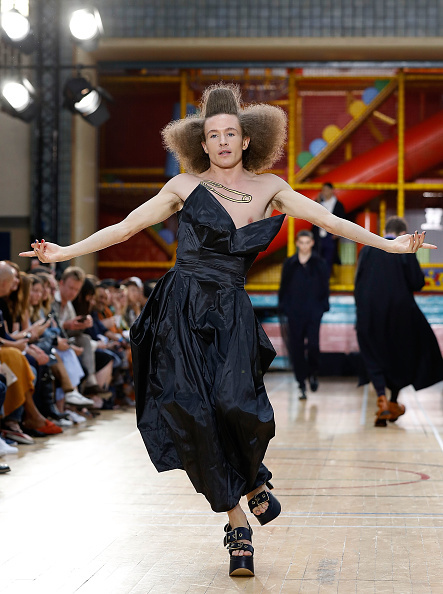 This season featured dancers and contortionists who turned the runway into a next-level fashion freak show, all clad in the latest season’s designs. 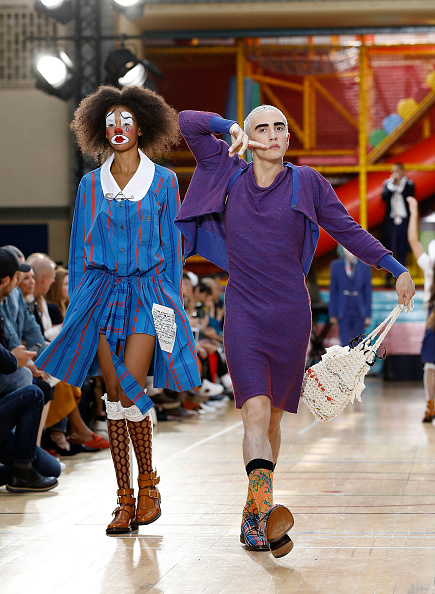 Bright purples, stark tartans, and crinkled satins all made appearances on the runway in Vivienne Westwood’s quirky silhouettes, which serve as a reminder that she abides by no man’s rules. 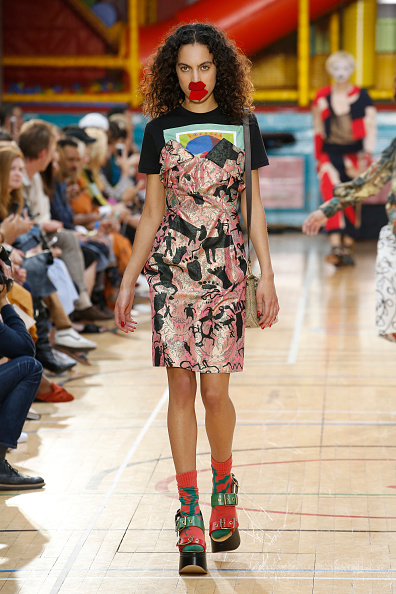 There were also staples of Vivienne Westwood’s design house: cut-up slogan tee shirts, safety pins, corsets, tartan, wild prints, elegant draping, and plenty of gender-fluid fashion. But there were unexpected accents employed by the designer. Westwood used graphic motifs indicative of playing cards — hearts, diamonds, triangles, and a phallus — to represent love and a free world, greed, war, and the selfishness of oil-hungry corporations, respectively. This same idea could also be reflected in the trash glued to model’s legs, and shoved into the fishnets others wore down the runway. Was this a reminder that we’re the ones killing Mother Nature? Probably! Perhaps that’s also why there was a sad clown in the show as well. Sometimes you just have to laugh through the tears, right? Although Vivienne’s political message is strong and clear, it doesn’t detract from the fact that the clothing that comprised this show was just as impactful. From the artfully constructed black gowns, to deconstructed jumpsuits and sack dresses, this is classic Vivienne Westwood for the new age. And ending the show by sitting on the shoulders of one of the models? Well, that’s just Vivienne. 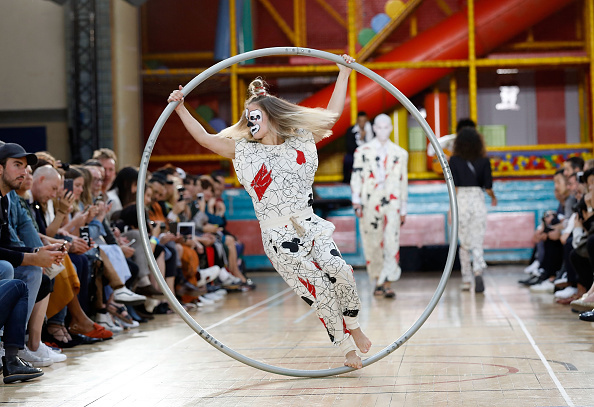 You can always expect the unexpected at a Vivienne Westwood show.